Flash and multi-language instruction manual, that's it. 42 (138') ISO 100, @105mm zoom position, and 34 (112') at 50mm zoom. 1.6" X .8" (40mm X 20mm). No color. Pushing the "light" button illuminates the screen in ruby red for about 10 seconds. Displayed items include; flash range indicator, zoom position, TTL/Manual , Power ratio setting, exposure compensation ±1.5, digital (aps-c) or 35mm (full frame) mode, (WP) wide panel down indicator, and auto or manual zoom setting. Yes, after fifteen minutes it goes into sleep mode, but will never turn off completely; wakes up after pressing any button on flash, or the camera's shutter button, but wait for flash to charge before using. Yes, but you have to manually select "35mm" or "digital" mode; "digital" means APS-C.
2.6"W x 6.5H x 2.2D 65mm x 165mm x 57mm Maximum length 6.5" (165mm) including shoe mount. Length and depth measured with flash flat. Will not work with Radiopoppers™ triggers with Sony cable adapter, and won't work well at all with Sony live-view mode. Doesn't function correctly (and is not usable) in Sony's live view mode; seems to default to full power blast for all shots. Tested on Sony A580, but may work properly with other brands. Recharge times are too long at higher power settings. 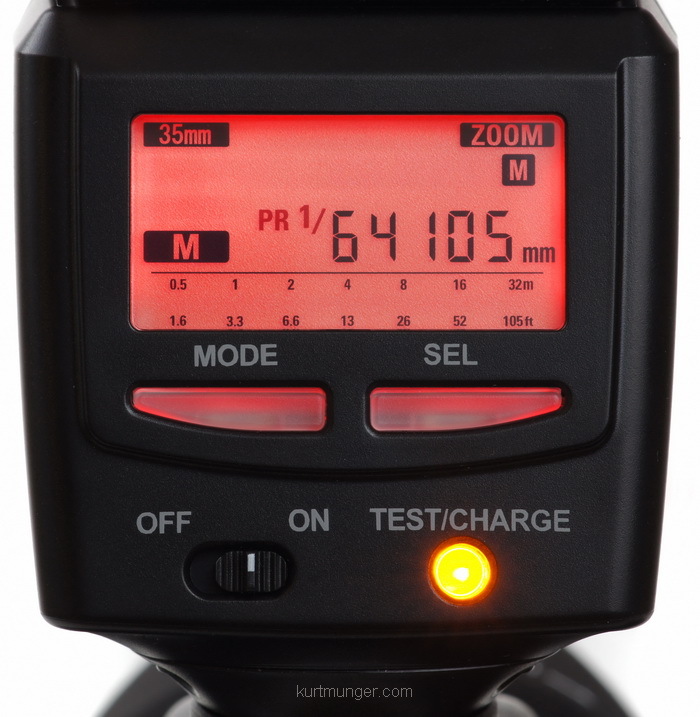 This flash is the same one Fuji sells for the X100 camera at a much higher cost, only the hotshoe style is different.